Our new guide for care staff- available via hard copy from the Ageing & Dementia Research Centre or downloadable from here. To download a copy of the guide, you will need to first complete a registration form and thereafter you will receive an email with the guide. Please click here to proceed. 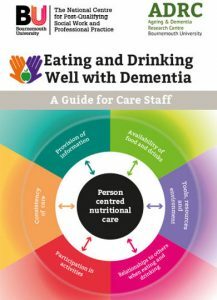 This guide has been developed from research to understand the quality and delivery of nutritional care for people living with dementia in combination with best practice examples from across the country, to design and develop evidence-informed education and training. 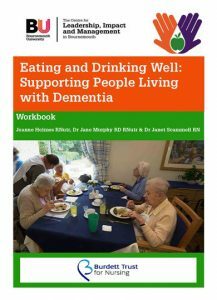 We are pleased to announce our ‘Eating and Drinking Well: Supporting People Living with Dementia’ workbook is available online. You will need to complete a registration form and thereafter you will receive an email. On receipt of this email, you can download your workbook, complete online and should you wish, you can then print it off. Please click here to proceed. Please follow details below to complete the short online quiz to receive your Certificate from Bournemouth University. Completed the workbook and watched the training film? Please click here to complete our short online quiz to test your knowledge of the new Workbook and DVD ‘Eating and Drinking Well: Supporting People Living with Dementia’ . If you are successful you will receive a Certificate from Bournemouth University. Eating and Drinking Well Nutritional Leaflet now available! Based on our research findings, we have developed this leaflet in collaboration with the Wessex Academic Health Science Network. It provides advice on how to increase food and fluid intake for people living with dementia. Please click here to view. 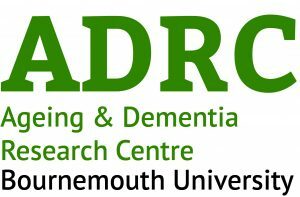 BU is working in partnership with the Borough of Poole Council, Partners in Care, the Dorset Local Enterprise Partnership and national care homes and private care home organisations in the delivery of this exciting and innovative research project, funded by The Burdett Trust for Nursing. A whole care home approach is a key element of this project that will require the involvement of service users, families and carers of people with dementia as part of the project. Ensuring appropriate food and nutrition is a vital part in delivering dignity in care for people with dementia. Eating and drinking becomes increasingly difficult as a result of the disease that puts people at increased risk of severe malnutrition (under nutrition) and weight loss. Worryingly there are no standardised ways to maintain adequate nutrition in people with dementia as the challenges of meeting appropriate nutrition and hydration continue to be reported. To tackle these ongoing concerns, Dr Jane Murphy and Joanne Holmes have been awarded a grant by The Burdett Trust for Nursing to undertake a ground breaking research project. It will equip front-line nurses and care home staff with the skills needed to improve the delivery of nutrition for people living with dementia in the community achieved through evidence-based learning in nutrition and empowered leadership. Jane Murphy, Joanne Holmes and Cindy Brooks are responsible for the research. They are being advised and guided by the steering group comprising representatives from the partners. Identify best practice for delivering excellence in nutrition and dignity in dementia care. Working with local care-homes, we will gather information on nutrition-related care from everyone involved in the care of the person with dementia. Establish high quality education and learning. Our research will inform the development of a high quality learning programme to empower nursing, care and catering staff in care homes.